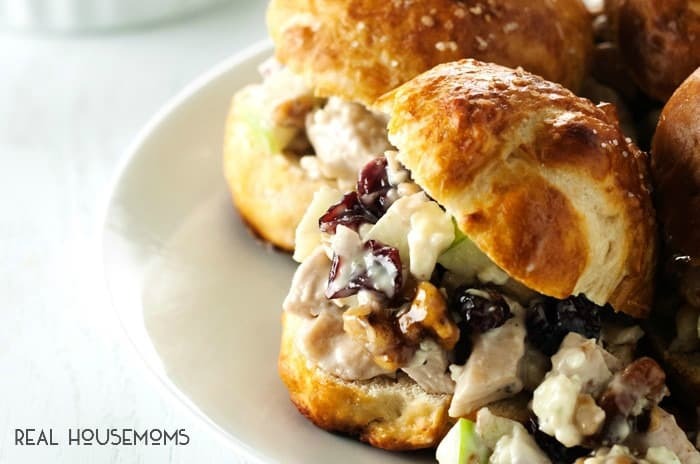 Serve a few or serve a crowd with these simple and delicious BALSAMIC CHICKEN SALAD SANDWICHES! This is going to sound super weird, and maybe kind of funny too, but I have always, always, hated chicken salad anything. Ew. Maybe it’s because every kind I have ever tried has been so heavily laden in Miracle Whip, or too mayo-y, or too mushy, or I dunno. But I have never liked it. These Balsamic Chicken Salad Sandwiches though? ZOMG. And I know you’re sitting there asking me why on earth am I even trying to make something that I so clearly hate?! Well, it’s because I am the only one in my family who has such an intense hate for chicken salad anything. So I thought I would tackle my issues and try to come up with something that I could enjoy as well. The first thing was to get rid of grapes. Just no. I love grapes, but they just do not belong in chicken salad. Nope. Not going there. I still wanted a refreshing crunch though, so I went with some tart apples instead. I also threw in some honey glazed walnuts, dried cranberries, and omg some salty and delicious feta cheese. It does wonders to balance out the sweetness. And the dressing? Seriously! Just wait til you try it, it’s amazeballs. 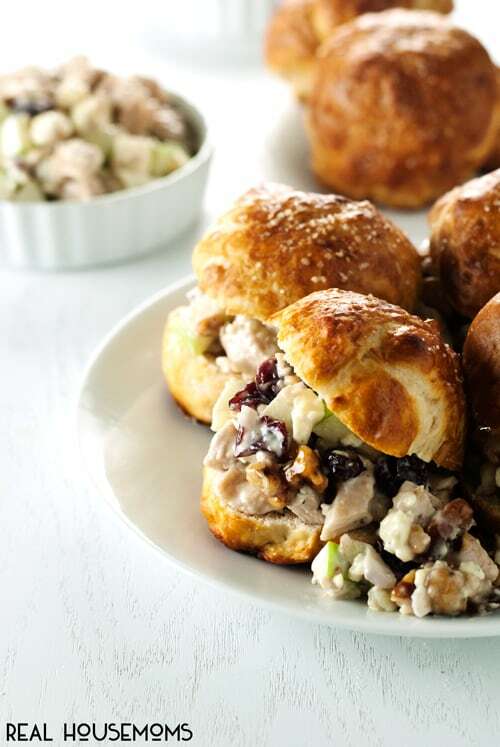 I recommend my pretzel rolls for these balsamic chicken salad sandwiches. It really is a winning combination. Just omit the cheese and bacon and you’re good to go! This makes a very simple and quick dinner that can feed a herd of hungry people over the holidays, so why not pack it in you arsenal and get to enjoying some delicious food! 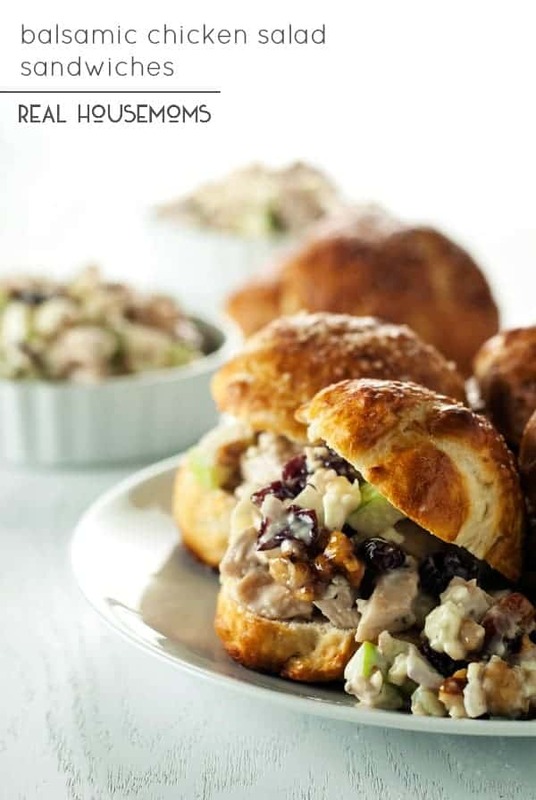 Get more great reipces like this one on our Best Dinner Recipes pin board! Follow Real Housemoms’s board Best Dinner Recipes | RH on Pinterest. 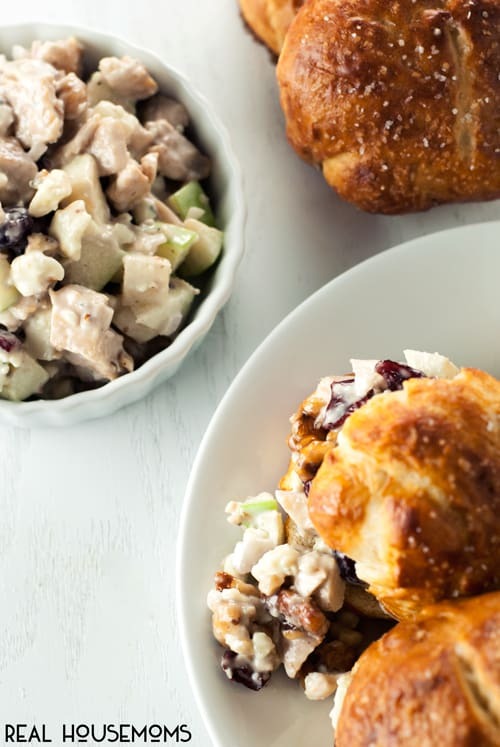 In a large bowl, mix together the chicken, apples, cranberries, feta, walnuts, and red onion. Set aside. In a smaller bowl, whisk together the mayonnaise, vinegar, sugar, salt, and pepper. Adjust seasoning as needed. Pour the dressing into the larger bowl and mix thoroughly to combine. 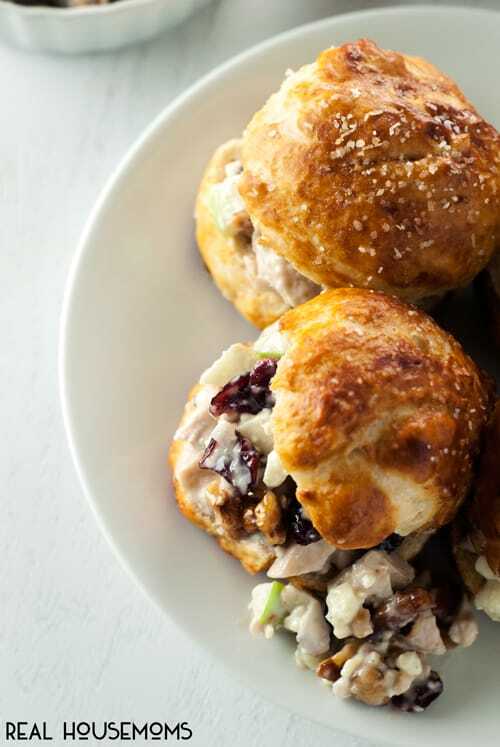 Divide between pretzel rolls and serve immediately. Still hungry? Then try my Cake Mix Cookie Bar Sandwiches for dessert!